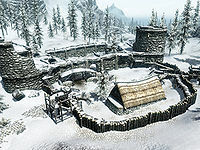 Fort Dunstad is a large fort occupied by bandits, located south of Dawnstar. The fort comprises a courtyard and three distinct interior zones: Fort Dunstad, Fort Dunstad Commander's Quarters, and Fort Dunstad Prison. A fourth zone, a tavern named The Stumbling Sabrecat, is located within the wooden stockade adjacent to the stone battlements, on the eastern side of the fort. The bandits are replaced by either Imperial or Stormcloak soldiers during the Civil War questline, and the entire fort receives several cosmetic modifications: the interiors are tidied up and in some cases repurposed, while the body of the unfortunate Baral Sendu is removed from the tavern. The body of an unfortunate Dunmer alchemist can be seen inside of a cage hanging from a beam off of one of the towers. The main entrance is at ground level and the interior features a large room, opening on the left to a spiral staircase bracing the tower. The tower itself has two levels built around a free-standing chimney (with harvestable charred skeevers) and a latrine complete with buckets, reading material, and a Potion of True Shot. A trapdoor at the top of the stairs allows access to the ruined exterior. Underneath the hot coals in the middle of the second floor room is a trapdoor that requires a key, but no key for it exists and it goes nowhere. Before the fort undergoes its conversion for the Civil War questline, approximately six leveled bandits[verification needed — Exact number?] roam the place, most of them apparently engaged in skeever fighting in the big room downstairs; two iron cages and a small arena have been set up for this purpose. This area is repurposed as a dining hall and dormitory later. Located in the northeast corner of the fort, it has two entrances, the main one at ground level and the other over the stone walls. It's also possible to reach the top of the tower from the topmost room using a trapdoor. A boss chest can be found at the top of the tower exterior, along with a bottle of Alto Wine and two potions of Resist Cold sitting next to an unoccupied chair. The door at ground level opens to a small set of stairs and a long hallway (with an oil slick) that eventually leads to the first level of the tower. This floor contains holding cells and a spiked trap, activated from a lever mounted on the wall. A spiral staircase provides access to the second level, with more cells, an alchemy lab, a table and a grindstone. A copy of the Heavy Armor skill book 2920, MidYear, v6 can be found on a shelf next to the lab. An open cage container between the alchemy lab and the doorway holds several healing potions. There's also another oil puddle in this room. Up to two bandit chiefs can spawn here and hostile skeevers are being held in the cells of both levels of the tower. Four bone chimes hang near the top of the staircase, ready to alert the occupants. The only entrance is above the stone battlements, on the west wall. To the left of it there is a small arch bridging the space where the fort's forge is located. The interior comprises a small hallway connected to a bedroom on the right. There's a free standing alchemy lab and four cupboards in the hallway, but after starting the Civil War quests, a long table with a strategic map of Skyrim is added and the lab is replaced by a large wooden chest. Until that time too, a leveled bandit wizard spawns in the bedroom, which features a double bed, two cupboards, two end tables, and a dresser. The skeevers kept by the bandits during their occupation of the fort are mistakenly hostile to the bandits themselves. This page was last modified on 16 November 2018, at 04:00.